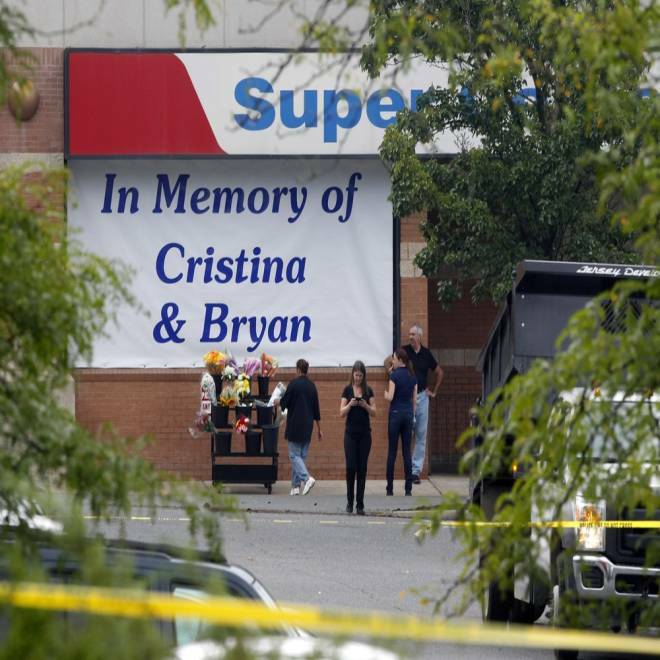 People stand in front of the closed Pathmark supermarket Wednesday, Sept. 5, 2012, in Old Bridge, N.J., where employees, Cristina LoBrutto, 18, and Bryan Breen, 24, were shot and killed during the overnight shift Friday by co-worker Terence Tyler who committed suicide at the store. Employees at a New Jersey supermarket hid in storage spaces, snuck out through back exits and ran through parking lots as they begged 911 dispatchers to hurry and send help when a co-worker started shooting at them. "I don't want to die, please," a woman hiding in a back room softly told a 911 dispatcher. The calls from the Aug. 31 shooting at the Pathmark in Old Bridge were released Thursday. They paint a scene of chaos and fear — a woman whispering and breathing heavily, others in the store afraid the gunman might sneak up on them. "Guy with a shotgun," one man, apparently winded from running into a nearby parking lot, told a dispatcher. "He's blowing the place apart." Authorities say employee Terence Tyler, a former Marine, shot two co-workers and then killed himself. Cristina LoBrutto, 18, and Bryan Breen, 24, each died of a single gunshot wound. Both were Old Bridge residents. Investigators determined that Tyler shot Breen and LoBrutto with an assault rifle then turned a handgun on himself. Family members said Tyler, 23, who also lived in Old Bridge, was discharged from the Marines after suffering from depression and had never gotten over his mother's death. People on the calls identified the shooter as an ex-Marine named Terence who started working at the store two weeks earlier. No one knew his last name. One caller said Tyler was wearing "riot gear" and started shooting as he approached the store from the parking lot. The shooting started around 4 a.m.
Middlesex County prosecutor Bruce Kaplan inspects the scene of a shooting at a Pathmark grocery store in Old Bridge, N.J., Friday, Aug. 31. One co-worker said Tyler seemed angry while working the overnight shift. "He seemed very angry tonight. He didn't say anything to me. 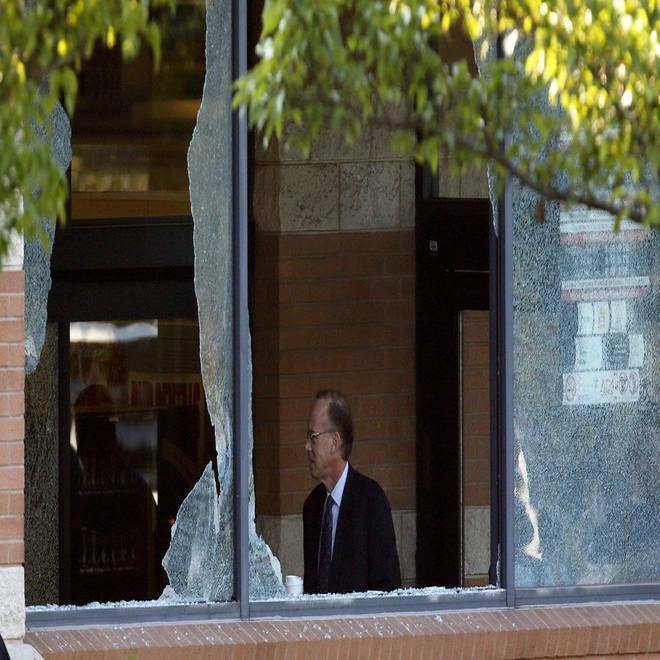 He walked right past me," an employee told a dispatcher. The employee said he did not know if Tyler had gotten in an argument with someone that night. The man said Tyler walked out of the store. "Where did Terence go?" the man said he asked his friend. "We just thought he quit. Like he walked out. All of a sudden we started hearing shots." Some callers didn't see Tyler but hid when they heard gunshots or ran when another employee yelled for them to run. One man said he ran outside but came back in the store and hid in a back room. He exited the store while on the phone with a dispatcher and held his hands up as he walked around the store. A woman said she heard about 20 shots fired while hiding in a storage room at the end of aisle four. She heard more on the phone. "He just shot again," she told a dispatcher. "He just had two more shots." Another woman hiding in the store worried that the gunman would discover she was there. "He can find me," she said. "He can find me." Video: Was cash-from-car chase 'Robin Hood' situation?